An attribution for the Christ has thus far proved elusive, as often happens in the case of small-scale, unsigned works destined for private owners. But the emotional charge and consummate execution of this figure prove that a familiar artist's name is not necessary to recognize a masterpiece. Carved from elephant ivory, Christ's body was made in sections. Even if a tusk were large enough to yield the body and arm span in one piece, a considerable amount of the precious ivory would be cut away and wasted. Thus the arms were carved separately and skillfully attached. Carefully studying bone structure, musculature, and veins, the sculptor created a beautifully articulated body in agony. Fingers curl and toes clench in pain, the arms taut and straining with the pull of the body's weight. The head falls forward onto the chest, turning slightly to the figure's left in a manner that stresses the powerful bent neck. Two plugged holes at the top of the head may indicate that a halo or crown of thorns was once attached. The facial features are sharp, the delicate beard set so low that the cheeks appear almost clean-shaven. The loincloth, crumpled into deep, abundant folds, winds around a heavy looped rope. Gravity seems to pull down the head, the coiled hair, and the garment on Christ's left, while the hair and loose folds fly up on the right as if caught by a gust of wind. Research continues on the origin of this work. Most of the associations proposed are with German sculpture, but so far nothing securely by the same hand has been found. A resemblance has been suggested between the facial type of Christ and the warrior heads carved in stone by Andreas Schlüter (c. 1660 - 1740) on the exterior of the Zeughaus in Berlin. While this master did not work in ivory, his style could have influenced those who did. 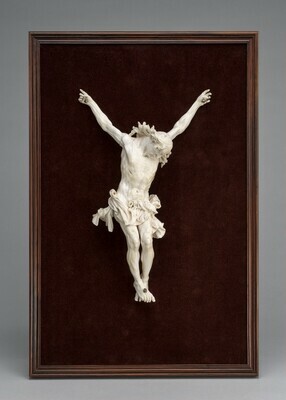 The treatment of the loincloth, rendered in crumpled, flying folds, resembles that in an ivory crucifix in the Castello Sforzesco, Milan, assigned to a German workshop of the seventeenth century. The remarkable hair, swept upward, may indicate training by a master such as the anonymous carver of the putti decorating an ivory goblet produced by Marcus Heiden in 1631;  in that case, theChrist would date well before 1700. The deep undercutting of the locks lifting from the back of the neck, however, surpasses the comparable passages in the Heiden associate's work, and the rendering of drapery is more complicated and spatially rich. From noon on, darkness came over the whole land until three in the afternoon...Then Jesus cried again with a loud voice and breathed his last. At that moment the curtain of the temple was torn in two, from top to bottom. The earth shook, and the rocks were split. The tombs also were opened. The passage seems to imply a turbulent wind, driving dark clouds across the sky, tearing the curtain, and sweeping over the wracked earth. Lifting Christ's hair and drapery, this force evokes the death agony and its cosmic consequences. 1. For an introduction see Richard Randall, ed., Masterpieces of Ivory from the Walters Art Gallery (New York, 1985), 9 - 16. 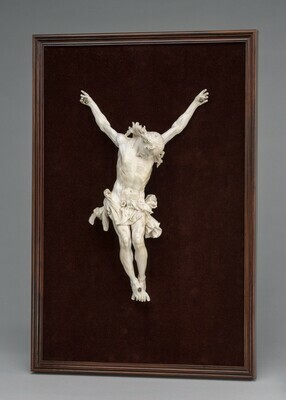 For a connoisseur's appreciation of ivory works like the Washington Christ Crucified, see Arthur K. Wheelock Jr., A Collector's Cabinet [exh. cat., National Gallery of Art] (Washington, 1998), 43, 71, fig. 36, no. 100. 2. Proposed by Florian Eitle in Skulpturen alter Meister und Europäisches Kunstgewerbe aus Sechs Jahrhunderten [exh. cat., Julius Böhler Gallery] (Munich, 1995), no. 27. 3. Compare Oleg Zastrow, Museo d'arti applicate: gli avori (Milan, 1978), no. 133, pl. 344, inv. N. 118, h. 13.5 cm. 4. For the Heiden work of 1631 see Sabine Haag, "A Signed and Dated Ivory Goblet by Marcus Heiden,"J. Paul Getty Museum Journal 24 (1996), 45 - 59. She suggests that the putti on this goblet were carved by a virtuoso south German or Austrian master influenced by Georg Petel. Private collection; (Daniel Katz, London); sold to (Julius Böhler Gallery, Munich); purchased 6 June 1997 by NGA. A Collector's Cabinet, National Gallery of Art, Washington, D.C., 1998, no. 100, fig. 36.